Bashaud Breeland works out during Washington Redskins rookie minicamp at Redskins Park on May 17, 2014, in Ashburn, Virginia. Photo by Mark Wilson/Getty Images. Washington Redskins second-year cornerback Bashaud Breeland was suspended without pay for one game by the NFL Friday, nearly a full year after he was cited for marijuana possession. Breeland will miss the Redskins' first regular-season game, at home against the Miami Dolphins on Sept. 13. "It's a big loss for us, because not only can he play inside at nickel, he can play outside. And he's a key member of our special teams," Washington coach Jay Gruden said. "We'll have to get somebody else ready." 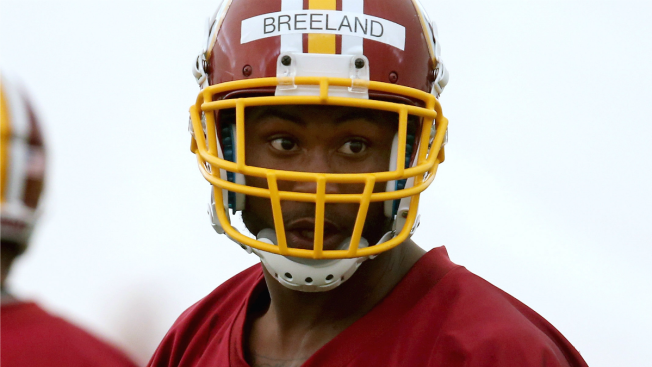 The league said Breeland was suspended for violating the substance abuse policy. He can participate in preseason practices and exhibition games. Breeland was cited for misdemeanor possession of marijuana the night before the Redskins broke training camp in August 2014. The fourth-round draft pick was cited on the campus of Virginia Commonwealth University, about a dozen blocks from the Redskins' training camp facility. When asked why the punishment comes so much later, "I have no idea," Gruden said. The team originally said Breeland would speak to the media after practice Friday, but the cornerback was carted off the field after being injured during practice. Gruden told reporters on Saturday that Breeland would be out 4-6 weeks from a strained MCL, described "best case scenario probably for what we thought," according to the coach. He played in 15 games and made two interceptions last for the Redskins, who went 4-12.